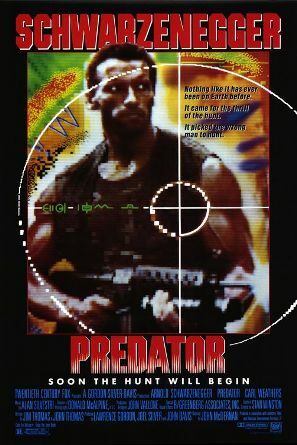 “Predator” is the baby if you mixed together “Commando” and “Alien’’ into one which makes for a suspenseful, action packed science fiction film. With the recent sequel “Predators” and the combination with the Aliens series (AVP/AVP Requiem) has not done justice to this original film. The film stars action movie hero Arnold Schwarzenegger as the leader of a group of U.S army commandos that are dropped into the South American jungle to save hostages from a group of guerrilla fighters. They locate the captives and quickly move in to take out the terrorists with guns and macho one liners. They only realize later on as they begin to be picked off one by one and left skinned by the trees do Arnold and his comrades find out their not fighting guerrillas anymore. Little do they know they are walking into the hunting grounds of an interstellar predator. Each of the soldiers brings their own personality and never allows Arnold to steal the scene. While this story can be summed up two sentences, the film is a classic due to the fast paced action scenes, lush landscapes, special effects and dramatic soundtrack. Makes you overlook all the random manly scenes with no plot meaning just to see who’s the next guy to get picked off. John Mctiernan who also directed Die Hard, created a movie that is still entertaining even after the 15th time. I may not have been a child of the 80’s, but the movies then were fun to watch. It has a magic that grabs you every time it’s on cable television and forces you to watch all the way through. There’s a reason The Expendables was such a success as we are going full round back into the era of over the top macho action movies with large supporting casts. A film that never ages as it never tries to be the best action movie, but keeps itself fun with the amount of sheer dumb movie explosions it throws at you. Fun fact was is that not just Arnold eventually went on to run for government later on, but also Jesse Ventura and Sonny Landham. The suspense the film brings is from never truly seeing the alien for most of the film as well as the reasons behind the alien being on Earth. But all this is just to set up for a major clash of a deadly killing machine from space to hunt the most deadly game on Earth. Arnold is definitely the most dangerous man on Earth being THE ACTION movie hero of the 80’s. Handheld gattling guns, chewing tobacco and strong jawed language from military men make its stupid era influence into this timeless classic. Requires no alcohol to enjoy.